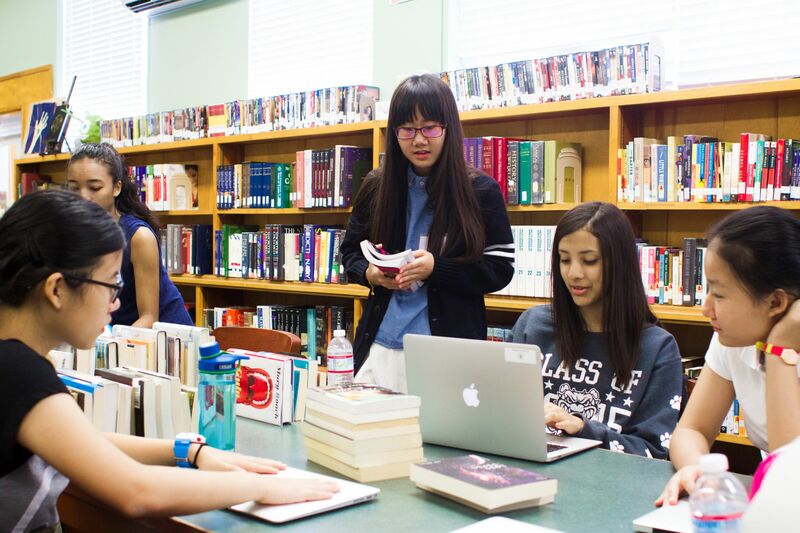 FSHA’s 1:1 Laptop Program, one of the first of its kind among area independent schools, harnesses 21st century digital resources to enrich programming and student learning. On any given day you will see our students using their laptops for creating original work, collaborating with classmates, organizing their materials and information, mastering research skills and reflecting on their classroom experiences. FSHA is committed to providing a 21st century education to all students by providing the tools necessary to fulfill that commitment. The use of technology is integrated into all departments and throughout the entire campus, every student and teacher participates in our 1:1 Laptop Program, and wireless Internet access is available in all areas of campus. All classrooms have large-screen projection systems, SMART Boards and digital document cameras. Microsoft Office, the Adobe Creative Suite and countless other digital tools are provided on all school computers, and students are encouraged to use a variety of web-based resources to enhance learning. Every morning, the students broadcast the daily school announcements via streaming video to all classrooms and offices on campus. 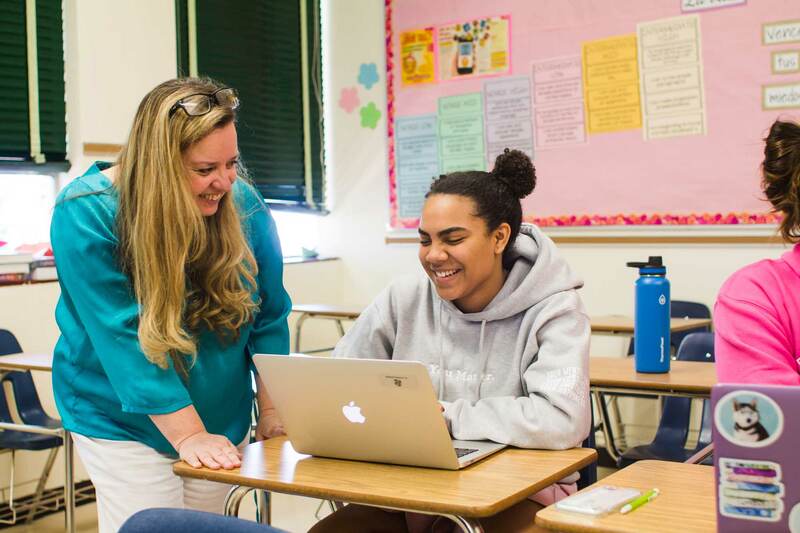 FSHA’s 1:1 Laptop Program, one of the first of its kind among area independent schools, harnesses 21st century digital resources to enrich programming and student learning. Because we believe technology is such a powerful learning tool, all students are issued their own MacBook Air at the start of the year. On any given day you will see our students using their laptops for creating original work, collaborating with classmates, organizing their materials and information, mastering research skills and reflecting on their classroom experiences. Students receive their laptops during Laptop Bootcamp. Our ultimate goal is to provide a rigorous, creative and innovative 21st-century learning environment for each and every student. This program provides anytime, anywhere access to a rich digital toolbox that aids our young women in their mastery of the essential skills and literacies they will use for the rest of their lives. Provides all students and classes with equitable and continuous access to extensive technology tools used throughout the curriculum. Cultivates leadership, collaboration and teamwork skills through digital communication and productivity tools. Promotes and facilitates student critical thinking, problem solving, innovation and real-life application of knowledge. Emphasizes electronic research and information literacy skills required for college and career success. Strengthens student technical skills and focus on balanced, ethical and responsible use of computers in today’s digital world. With several successful years under our belt, we are thrilled by the positive feedback we've gotten from students and teachers alike about this program. When math instructor Simone Butera wants to gauge student comprehension, he asks students to break out their SMART board clickers. He poses a multiple choice question to the class and within seconds, Simone knows if he can move onto the next concept or if he needs to spend more time on the previous one. Down the hall, Dr. Lara Walker has her students use the Photobooth application on their laptops for Spanish conversation practice. Students are able to save their conversations as movie files, and Lara is able to provide individualized feedback to each girl. And in Dr. Barrett Gough’s U.S. history class, students use an online program called Padlet to create online discussion boards about specific decades. Dr. Lara Walker checks in with a student during Spanish class. 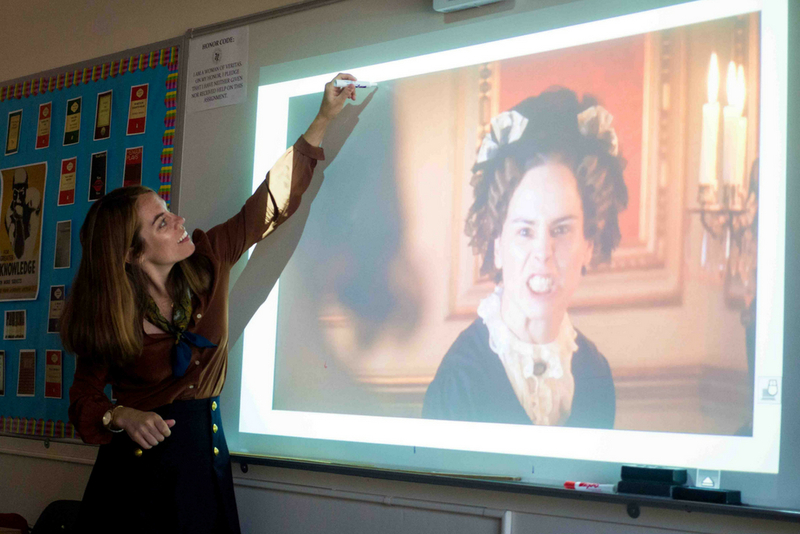 At FSHA, it’s not unusual for faculty to seamlessly integrate technology into their lesson plans. “I try to design assignments that allow for creative and scholarly expression in an array of media,” says Barrett. “At this point, we’d be foolish not to incorporate technology and new media. It’s a new and emerging form of literacy.” Since launching the 1:1 Laptop Program in the fall of 2012, it’s become one of the remarkable successes of the 2010-2015 Strategic Plan. All students, parents and alumnae have access to TologNet, which is the central communication system for the school. By logging into TologNet, students and parents have access to daily and long-term assignment information, grades, report cards, transcripts and course information. Current information regarding school announcements, events, sports and news for students and parents is updated daily. Student teams, groups and clubs use TologNet to share information. Graduates have access to the full alumnae directory, upcoming reunion information and fun ways to get involved in the online world of FSHA. 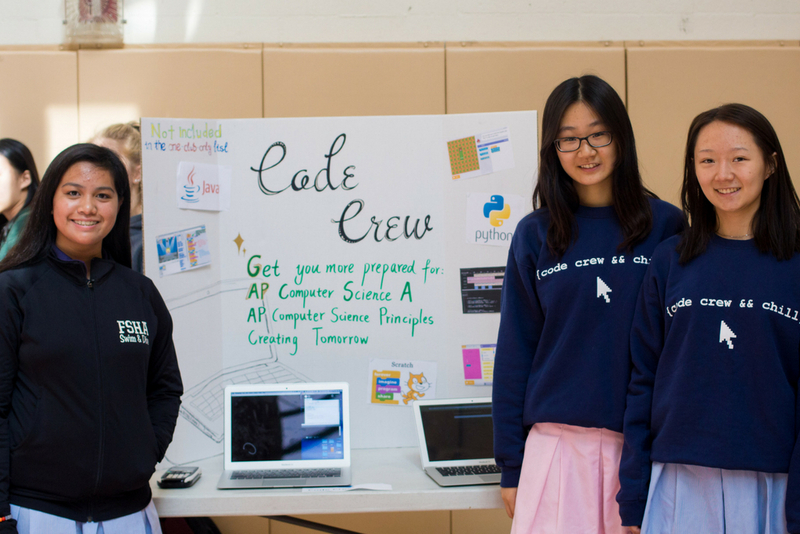 Q: Why does Flintridge Sacred Heart Academy have a 1:1 laptop program? A: Flintridge Sacred Heart Academy produces young women of faith who are lifelong learners and seekers of truth. We want our graduates to be globally connected leaders in an increasingly complex world. Key to this leadership is not only a mastery of the new tools of this digital age, but also the ability to interpret and critically evaluate the vast wealth of information that is now at our fingertips and to harness that information in the creation of new ideas and original material. In order to facilitate the acquisition of these skills, FSHA has developed a 1:1 (one-to-one) laptop program. In a 1:1 laptop program, each student is assigned a laptop that she can use both at school and at home. It provides anytime, anywhere access to all of the tools and resources her 21st-century education requires. Providing all students and classes with equitable and continuous access to extensive technology tools used throughout the curriculum. Cultivating leadership, collaboration and teamwork skills through digital communication and productivity tools. Promoting and facilitating students' critical thinking, problem solving, innovation and real-life application of knowledge. Emphasizing electronic research and information literacy skills required for college and career success. Strengthening student technical skills and focus on balanced, ethical and responsible use of computers in today’s digital world. Q: My daughter already owns a laptop. Will she be able to use it? A: For curricular consistency and program efficiency, all students need to use the same school-assigned laptops. The school maintains the computers and ensures that every student has the right technology tools needed for each class. In addition, teachers have an easier time instructing the students on how to use tools and access resources when there are uniform tools in place. Success of the program depends on hardware/software simplification and unification for the teachers and students to focus primarily on their curricular objectives, rather than technical issues due to incompatibilities and variations. Q: What support is provided to students? A tech boot camp is included in new student orientation each year. A centrally located Help Desk office is staffed by a dedicated full-time employee during school hours. Students can bring their laptops there for assistance or support, and loaner laptops are provided if problems aren’t immediately fixable. All laptops are re-imaged every summer to ensure that they are running clean installations of the latest operating system and have the required software for the coming year’s curricular needs. As all students and teachers have the same devices running the same software, the stronger users in any given class will be able to provide on-the-spot support and help to their peers. Q: What is expected of the students? Students are expected to bring their laptops to school every day in working order, with a fully charged battery and with its power adapter. They are expected to use their laptops legally, ethically, and in accordance with all applicable Acceptable Use Policies and Laptop Use Agreements. In addition to her laptop, each student will be provided a small external hard drive to be used for backing up her data, and she will be instructed in its use. She is solely responsible for her files and digital work, and for backing up important items regularly. Students are expected to treat their laptops with care in accordance with policies, guidelines and recommendations set forth by the FSHA Technology Department. Q: What happens if the laptop breaks or malfunctions? A: We have a centrally located Help Desk that's staffed during school hours where students can go with any problems that may arise with their laptops. Our technology staff can either quickly address the problem or, if the issue requires more troubleshooting or repair, issue a loaner laptop to the student so that she may return to class without delay. Software issues and many hardware repairs are dealt with on-site by our staff, and we make every effort to return the student's laptop to her in a timely manner. Policies regarding the costs of out-of-warranty repairs (accidental damage due to drops, spills, abuse, etc.) and theft are addressed in the Laptop Program Agreements for Parents and Students. Q: Who pays for this laptop program? A: The cost of running this laptop program is paid in large part by our families via an annual technology fee. This fee is paid every year that the student is enrolled at FSHA. The technology fee for the 2016-17 school year is $500. Additionally, large portions of our technology capital budget that previously paid for laptop carts, labs and other student-use computers are now be spent on this program. Q: How does the school deal with prevalent social networking and inappropriate non educational use of the internet at school? Does FSHA block any websites? A security firewall that protects against viruses, malware and intrusions. A web content filter. The content filter blocks particular websites in categories the school chooses. The websites in these categories come from a subscription service and are updated daily. The school can choose to make exceptions to the websites in these subscriptions (white list) or add sites manually to the list (black list). Currently, most social networking sites are blocked for student use on campus, although from time to time certain sites may be unblocked for specific lesson-related purposes. We stress responsible, ethical and respectful laptop use in the classroom setting and beyond. We expect the students to stay on task and use the Internet appropriately, and just as in the pre-digital era, the teacher is present and responsible for keeping the students focused and engaged in the lesson or project at hand. The teacher is in control of classroom and can ask students to close programs that are not germane to the lesson or close the lid of the laptop, much in the same way that the teacher can instruct a student to close a comic book.